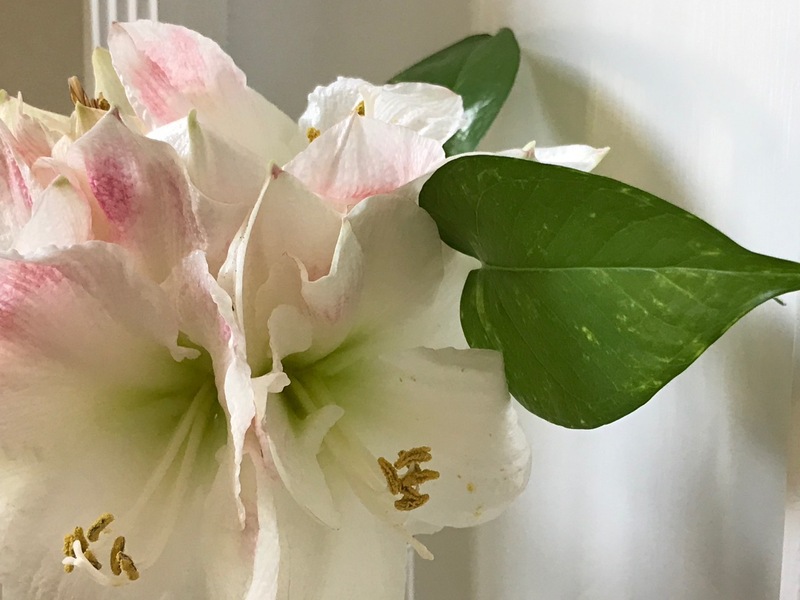 Each Monday Cathy at Rambling In The Garden invites us to share an arrangement using materials collected from our gardens. Like much of the United States my state of North Carolina has been in deep freeze, literally setting records for number of consecutive hours under freezing. Soon these snowy sidewalks and unfriendly temperatures will be just a memory. By Friday we should see 66 degree Fahrenheit. 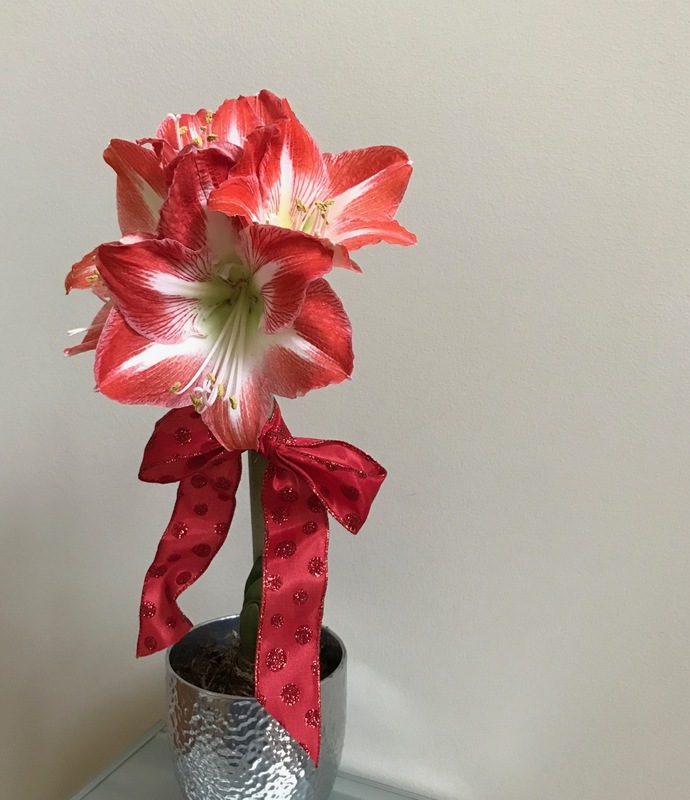 While waiting for that promised warmup I turned once again to the holiday Hippeastrum (amaryllis) featured in last week’s Monday vase. 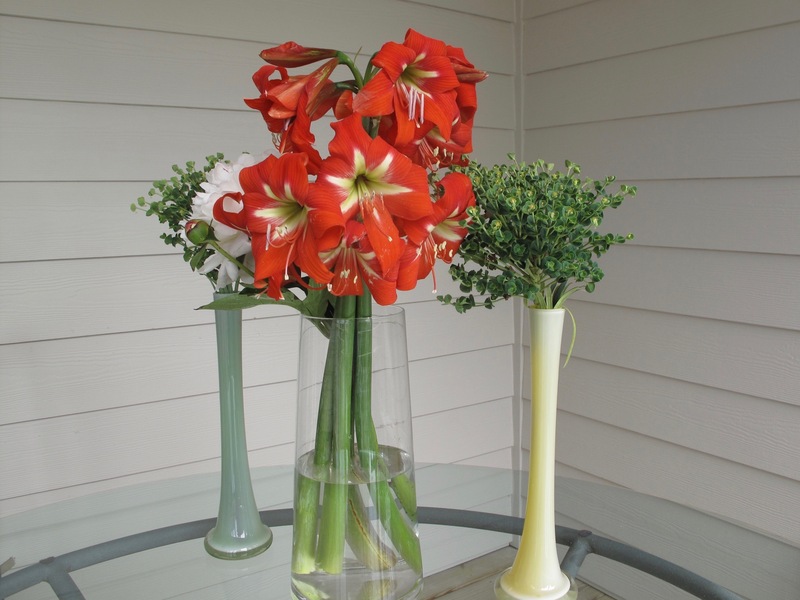 For inspiration I chose a special sculptural form to serve both as container and focal point for today’s design. Our multi-talented daughter is the artist. 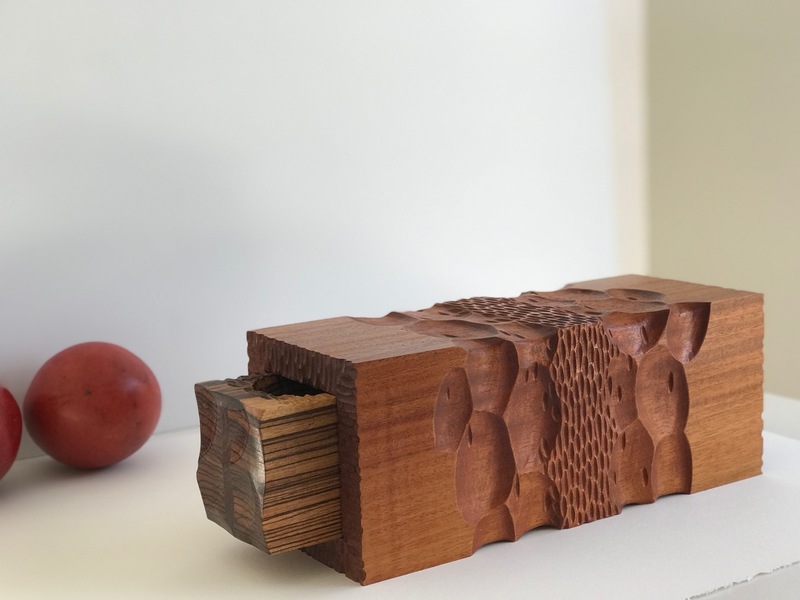 Now an architect in L.A. she also is a fine woodworker. 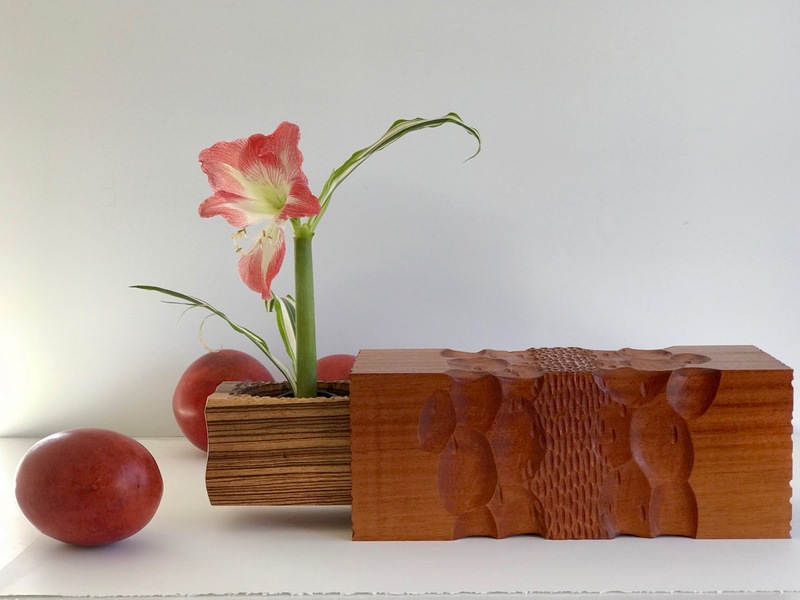 The Ikebana holder nestles comfortably into the leftmost pocket. 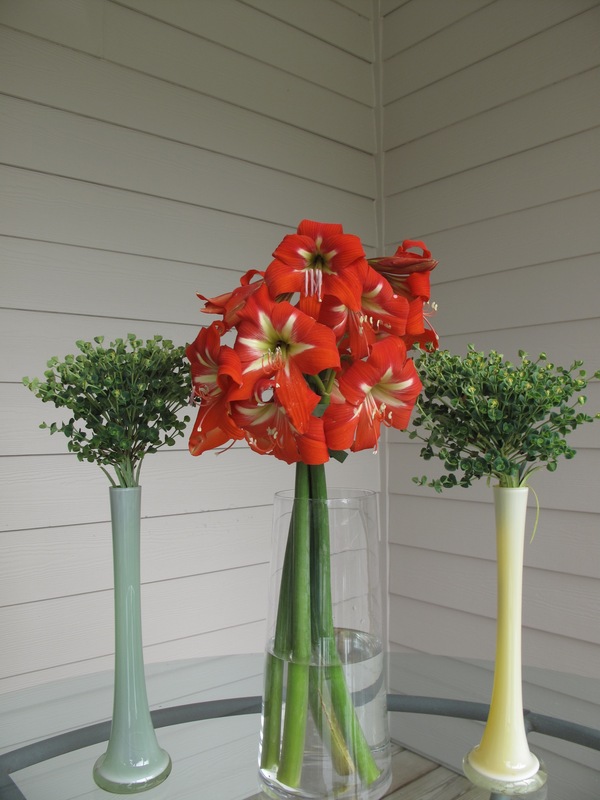 The three large red seedpods seemed necessary to complete the design. Thanks to Cathy at Rambling In The Garden for hosting each week. Visit her to discover what she and others found to place In A Vase On Monday. 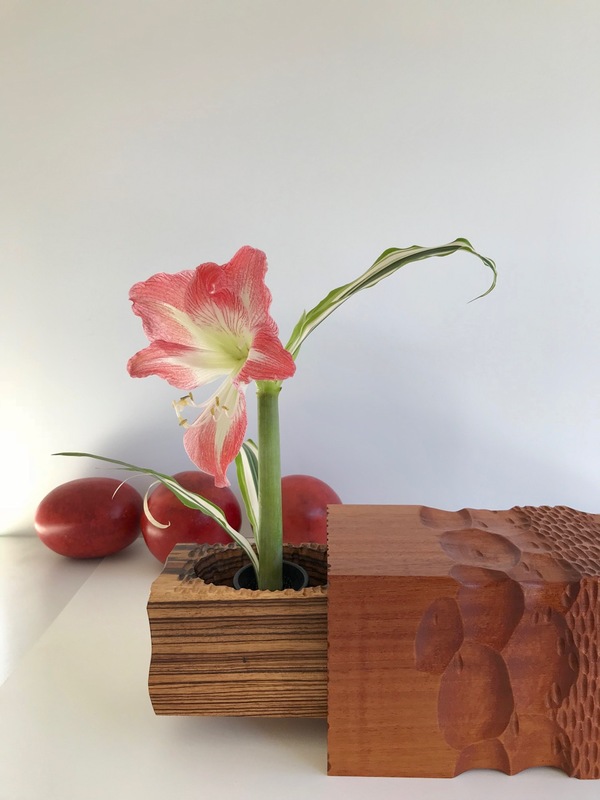 This entry was posted in garden and tagged 2018vase, ambi, carved box, flower arranging, flower design, Hippeastrum (Amaryllis), in a vase on monday, nature photography, sculpture on January 8, 2018 by pbmgarden. 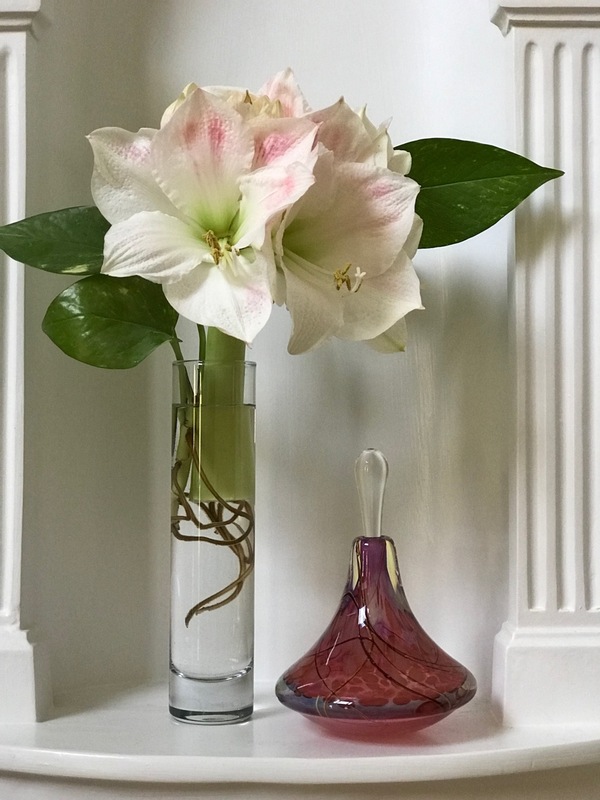 Today’s vase is from my indoor winter garden, a holiday peppermint from my sister Cindy. 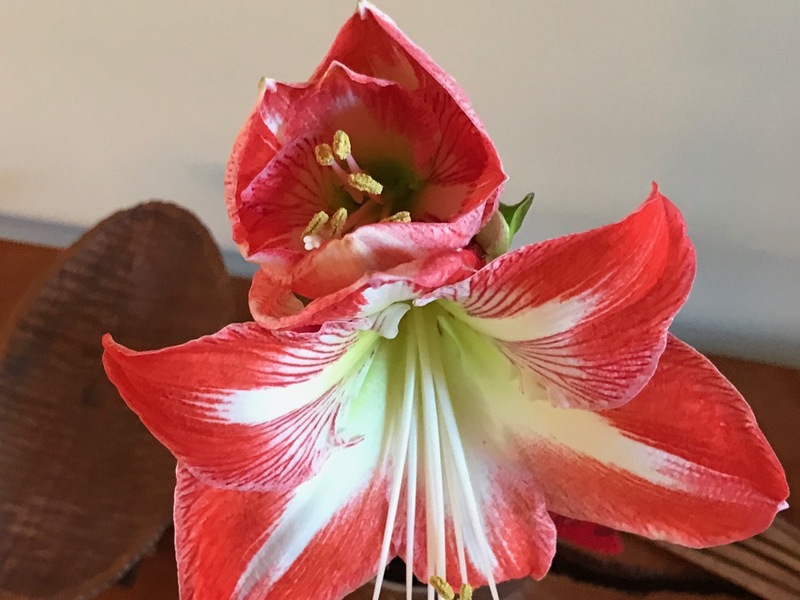 She has a good record of coaxing Hippeastrum (amaryllis) bulbs into bloom. 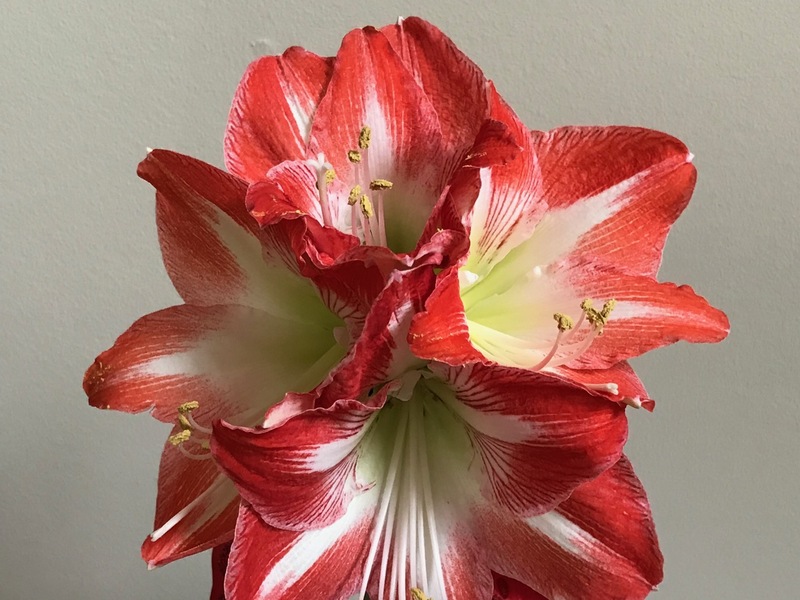 I had hoped to feature this amaryllis as my Christmas day vase last week, but I had to prepare the post several days early. At that time three buds were visible but only one was beginning to unfold, thwarting my plan. 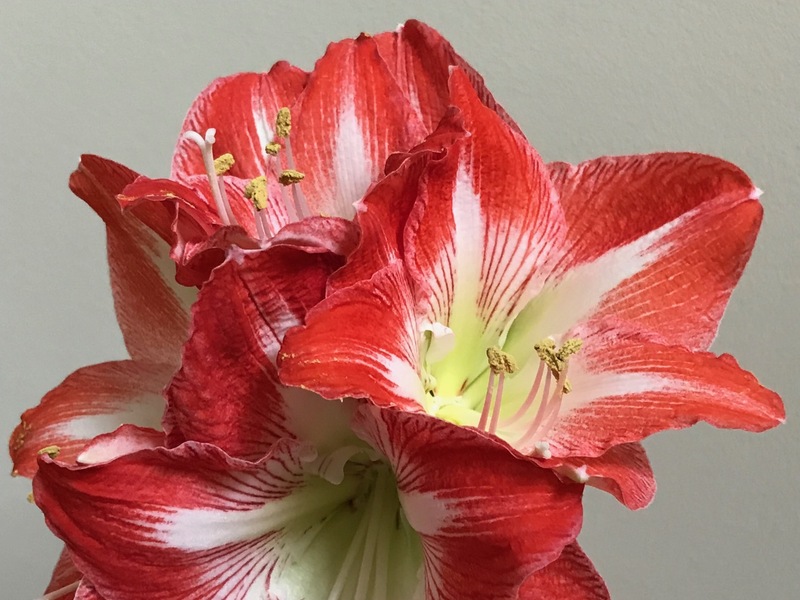 The next day, Christmas Eve, the first flower opened to reveal a green-tinged center, creamy stripes and dark pink accents. Then, Saturday morning, I was completely taken by surprise to find a fourth flower had inserted itself. How did I miss that last bud? 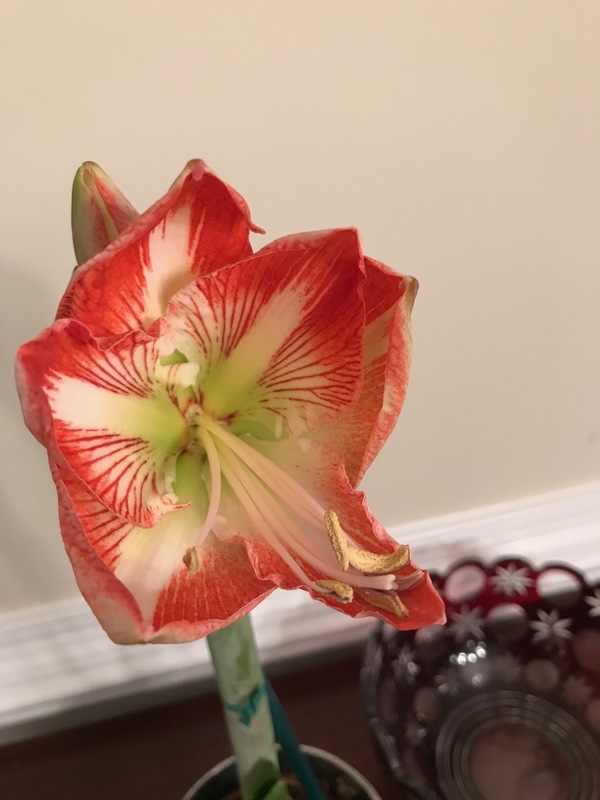 Eventually the amaryllis will be planted outdoors. 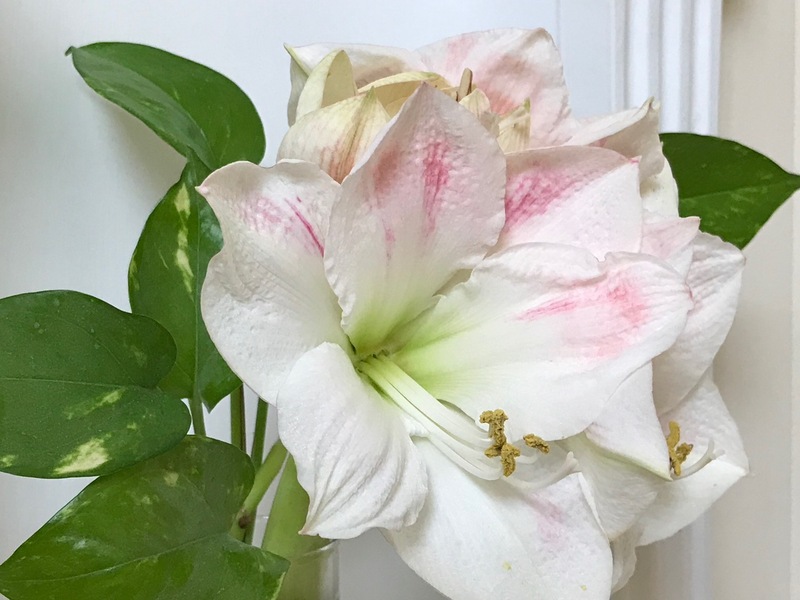 With luck it may bloom and again find its way into a Monday vase. 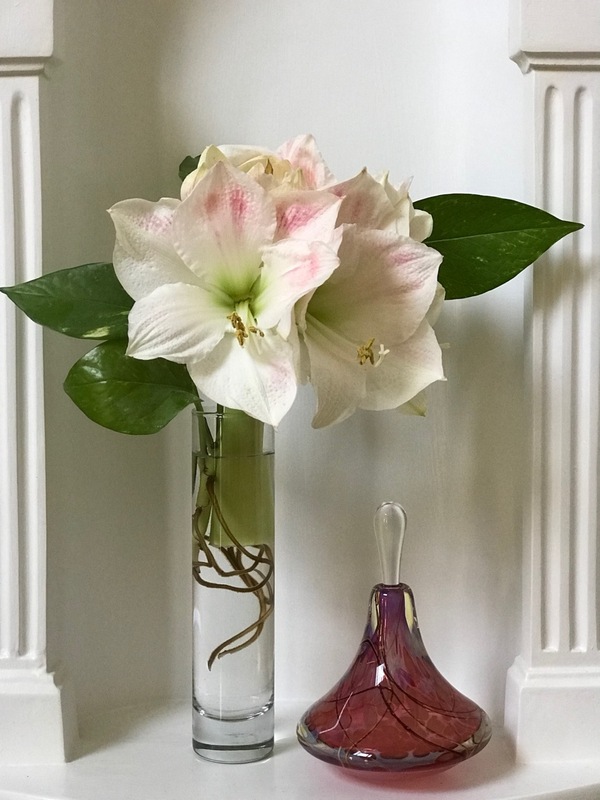 If you are one to enjoy looking back at last year, here is the entire collection of 2017 Monday vases. With gratefulness for your encouragement and friendship I wish you happiness, health and peace in the new year. Thanks to Cathy at Rambling In The Garden for hosting and giving us another year of flower arranging pleasure. Visit her to discover what she and others found to place In A Vase On Monday. 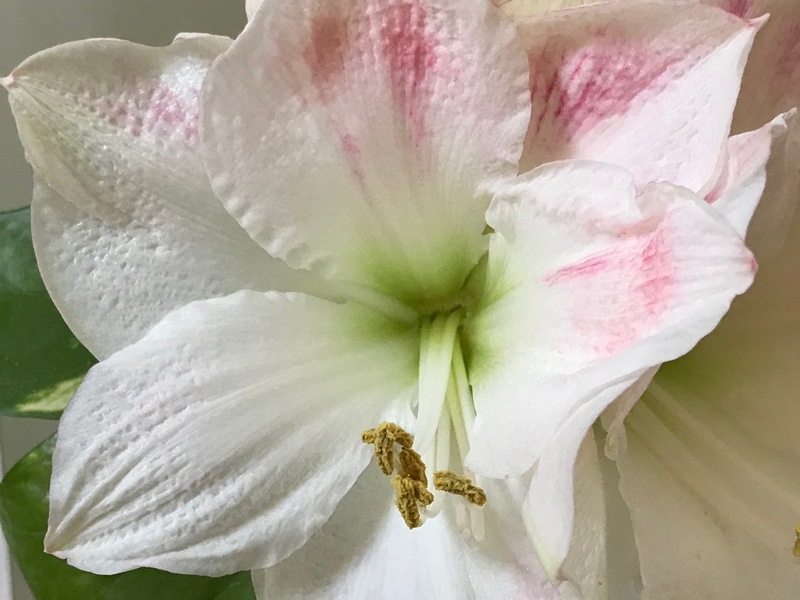 This entry was posted in garden and tagged 2018vase, flower arranging, flower design, Hippeastrum (Amaryllis), in a vase on monday, nature photography on January 1, 2018 by pbmgarden. On Saturday I visited my two sisters in Fayetteville and returned primed for a Monday vase. 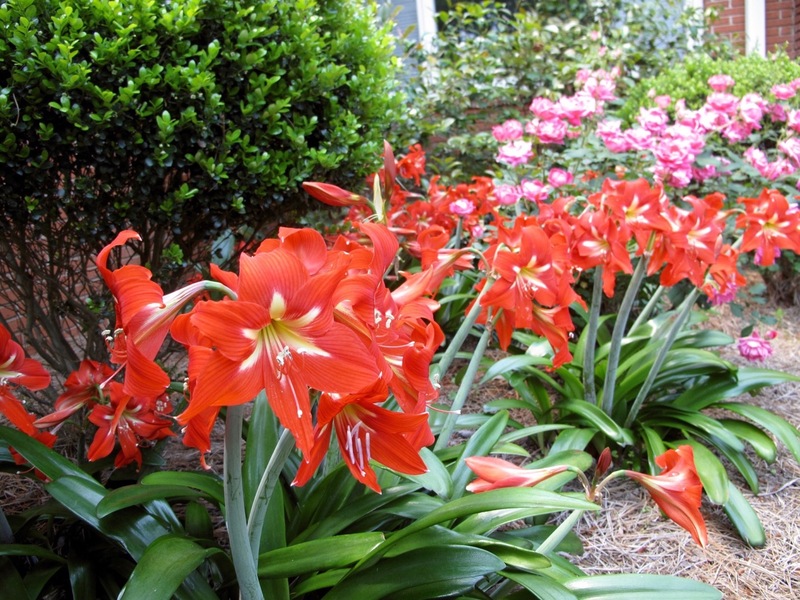 My sisters grow spectacular Hippeastrum (Amaryllis) in a garden bed near their front walkway. 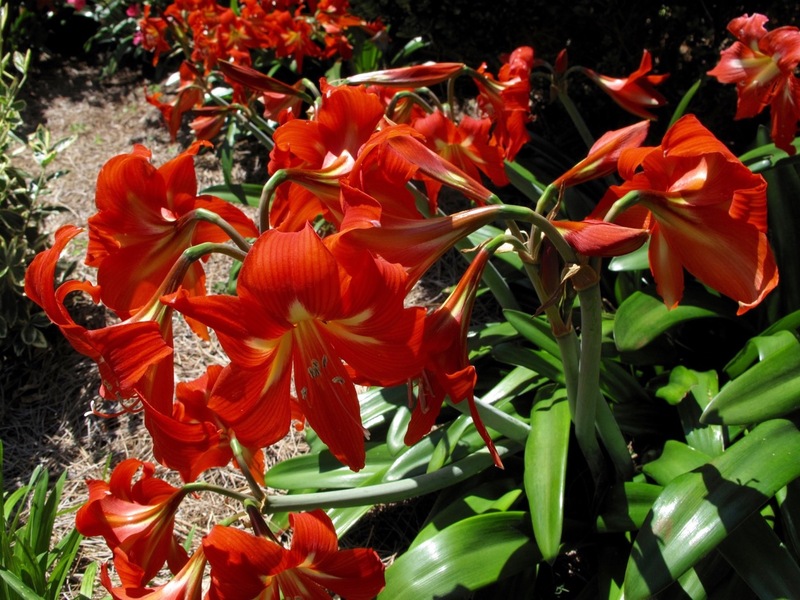 When this past year they had to remove several shrubs from the area, their amaryllis responded to the more open, sunnier situation with a profusion of blooms. My sisters generously offered the clippers and encouraged me to help myself. I chose four tall stalks and smiled all the way home. 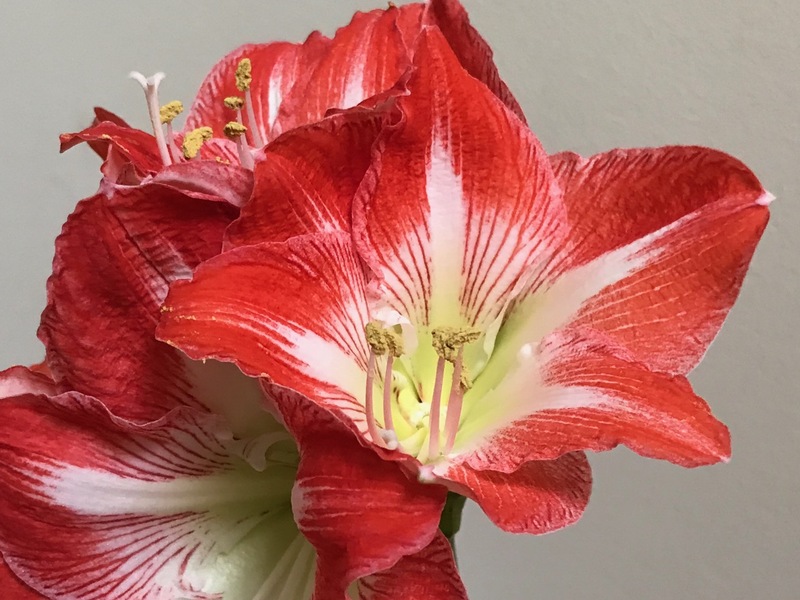 These flowers are simply amazing, but creating a floral design and taking photographs that do justice to these beauties has proved challenging. 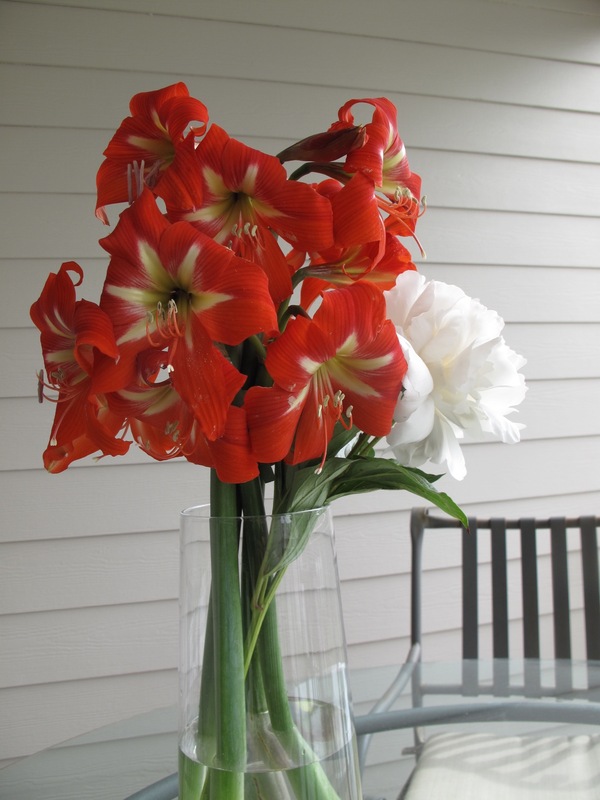 Had I cut them short the Hippeastrum might have been easier to arrange. 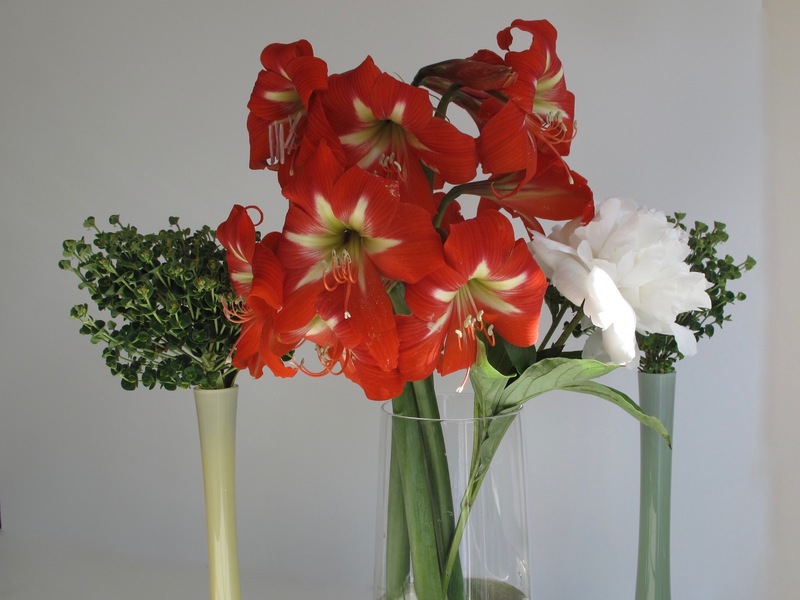 Maybe later in the week I will experiment, but for now I wanted to keep the stems long so I could use a special, deep vase of clear glass. I did cut all the stems the same length and used florist’s tape to bind them near the top. 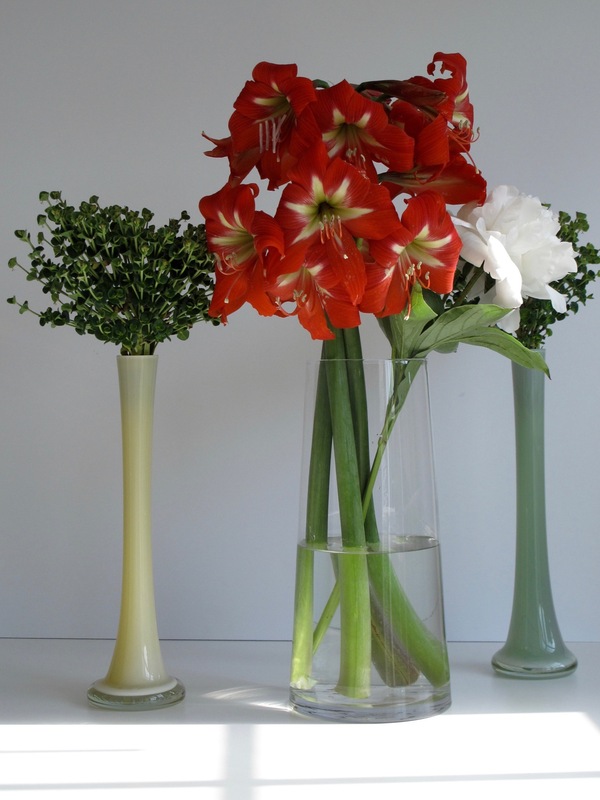 Included with the Hippeasturm is one stem of Paeonia ‘Festiva Maxima’ and two stems of Euphorbia ‘Shorty’ in separate pastel glass vases complete the arrangement. 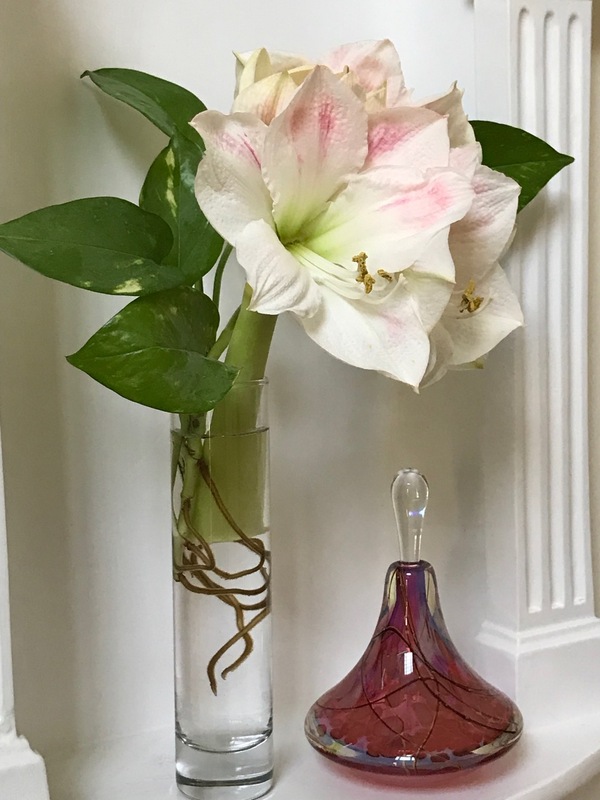 Because the peonies put up with such excessive rain last week and some still managed to open unharmed, I felt one deserved to be included in the vase today. I am not convinced it contributes to the design. 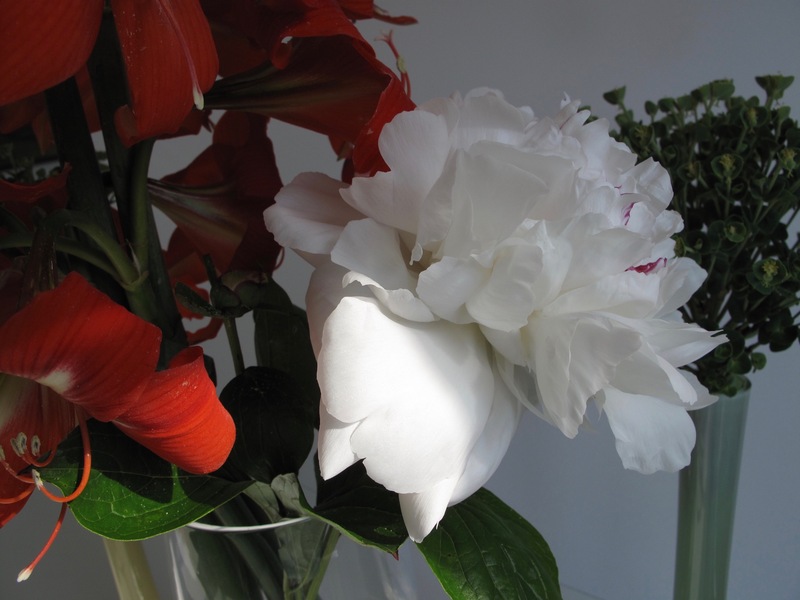 Without the peony the result felt incomplete. Perhaps some ribbon or burlap tied near the top of the middle vase? 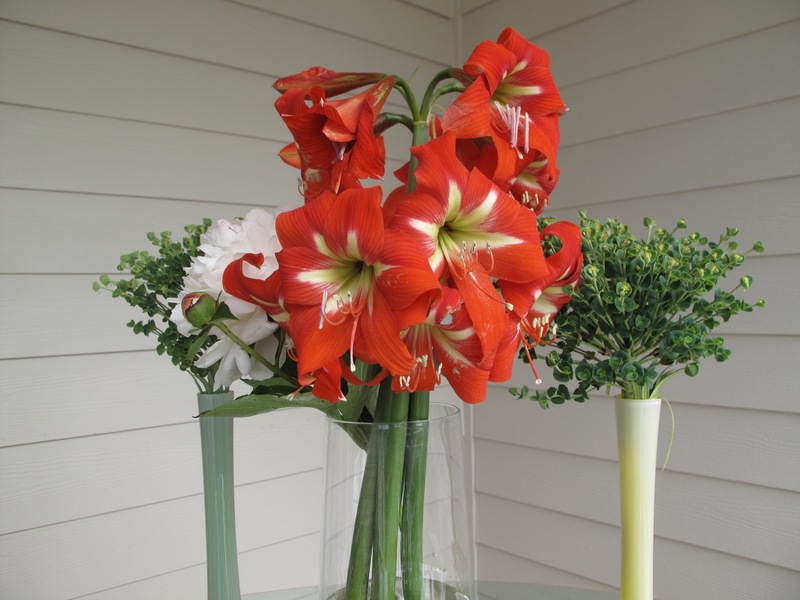 The Hippeastrum and the peony hold their own without the euphorbia. Eventually I had to stop fussing. Thanks to my sweet sisters, Judy and Cindy, for today’s flowers. 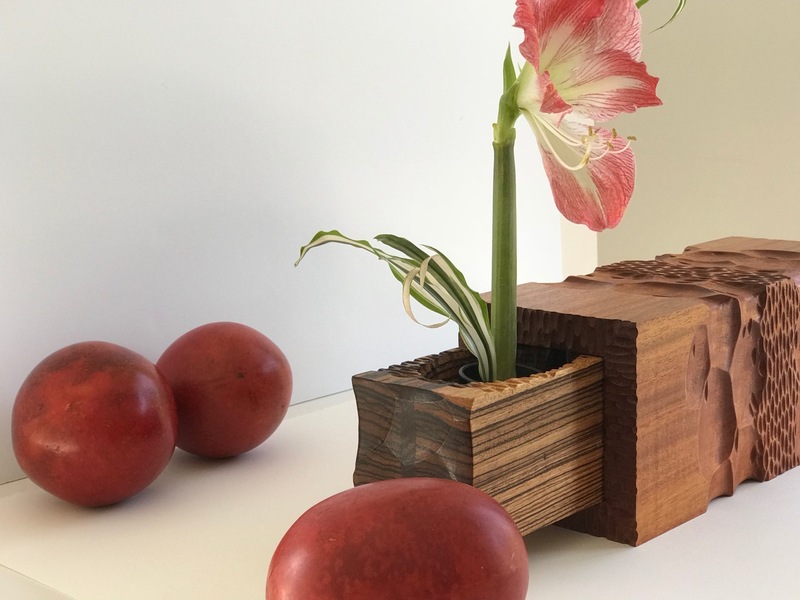 This entry was posted in garden and tagged Euphorbia 'Shorty' (Shorty Spurge), flower arranging, flower design, Hippeastrum (Amaryllis), in a vase on monday, nature photography, Paeonia ‘Festiva Maxima’ on May 9, 2016 by pbmgarden.